Malta is entirely composed of sedimentary rocks. This means that the geology of the islands is made of the compacted sediments of rocks deposited in a constantly changing Mediterranean over millions of years. 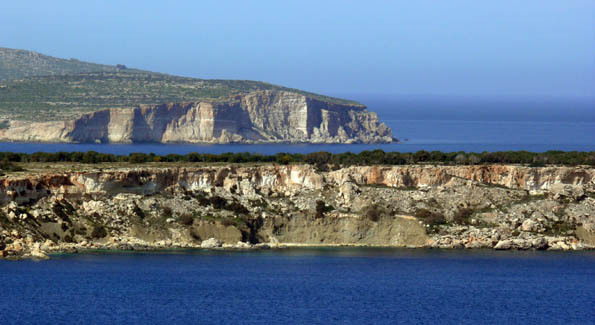 Effectively, all of the land comprising Maltese territory was formed underwater through the slow but steady layering of sediments of particles settling underwater. As is to be expected when viewing a series of layers, the ones at the bottom are the oldest with age gradually decreasing as one approaches the topmost layer. In the case of the Maltese rock layers, the oldest sediments of lower coralline limestone were deposited in the Mediterranean Sea around 35 million years ago while the most recent layers of upper coralline limestone were only formed a mere 7 million years ago. Although in human terms these timeframes seem immense, the young age of Maltese rocks is placed into perspective when considering that the extinction of the dinosaurs took place 65.5 million years ago. This means that when the lower layers of rock comprising our archipelago were being laid, the dinosaurs had already been extinct for more than 30 million years. Both Coralline Limestones were formed in shallow waters and comprise the skeletal remains of algae, corals and molluscs. The Globigerina Limestone, source of Malta’s honey coloured stone used for construction was formed at a period when the sea became deeper and is mostly made of the microscopic remains of a single-celled animal called globigerina. Lying above the globigerina layer, the blue clay layer originated on land, probably in Italy and was deposited as detritus from rivers draining water from the Italian landmass. Following the period that led to the depositing of the blue clay in a relatively deep sea, a shallower period with strong surface currents led to the deposit of the greensand layer. In spite of the colour associated with its name, greensand is generally visible in those Maltese sandy beaches where there are clay slopes and where the sand has a reddish hue. Beaches such as Ghajn Tuffieha, Gnejna and Imgiebah in Malta and Ramla l-Hamra and San Blas in Gozo all feature reddish sand that has found its way into the sea by sliding off the clay slopes surrounding these beaches. With respect to colours: the chemicals comprising greensand turn red when exposed to the air through the process of oxidisation! This short description is aimed at helping readers acquire a basic understanding of the geology of Malta. It is important to appreciate the marine origin of these islands, together with the fact that the very rock on which we stand is made of the remains of billions upon billions of dead marine creatures that were deposited at the bottom of the sea over a process spanning millions of years. It also helps explain why Malta lacks natural resources such as metals and why our fossils generally comprise marine organisms rather than land animals or plants. At a time when the impact of carbon-induced climate change is universally recognised, it is also relevant to ponder upon the fact that the entire landmass of the Maltese islands is comprised of carbonate rock implying that all the landmass we take so for granted consists of captured carbon dioxide which would otherwise have remained in the Earth’s atmosphere to the detriment of life as we know it!